THE PUBLIC ACCOUNTS Committee has heard claims that elements of the government have sought to undermine it in the controversy over chairman John McGuinness’s time as a government minister. As TDs spent over three-and-a-half hours discussing matters arising out of McGuinness’s time as a junior minister in the previous Finana Fáil government, the Fine Gael TD John Deasy suggested there were “political undertones” to the recent controversies surrounding McGuinness. Responding to this, McGuinness said that he had read articles recently which suggested that members of the committee were under pressure from within Fine Gael from their own ministers. 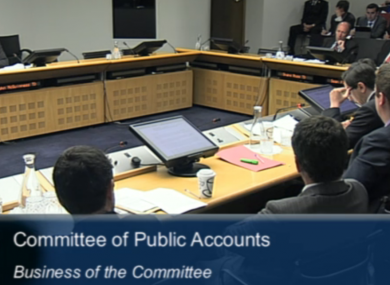 The PAC has been conducting initial inquiries into the banking collapse in anticipation of a full inquiry at some point in the future but there are questions as to whether this inquiry might be conducted by the Oireachtas Finance Committee, a forum chaired by a government TD. Fianna Fáil TD McGuinness said he had “never seen this level of scrutiny” of a former junior minister, referring to the recent controversy surrounding his expenditure as a Minister of State. But he also suggested that information was emanating from other government elements: “I am damn sure they are being leaked from the Department [of Enterprise, where he was a minister] – whether it’s from FOI or press enquiries. He said this was “the nature of things in the civil service” and added that there were “probably powerful forces out there” that did not want to see an inquiry into the collapse of the country’s banking system which led to the September 2008 government guarantee. Both Sinn Féin’s Mary Lou McDonald and the independent TD Shane Ross (above) expressed concerns about these comments. “If it is true that the government is trying to undermine the PAC and there are civil servants leaking information, the very least we can expect is a statement… reassuring us that our work is not undermined and that the respect for the independence of the PAC is continued. This prompted the Labour TD Derek Nolan to remark that the second part of the hearings this afternoon have been “a farce” insisting he had never been pressurised and slamming what he said was “conjecture” and “allegations of mud-throwing”. Fine Gael TD Paschal Donohoe said that allegations of “other forces” seeking to influence the committee were, as far as he was concerned, “utterly incorrect and untrue”. Labour’s Gerald Nash said he would resign from the committee were he approached by anyone in government who tried to interfere with his committee work. Committee vice-chair Kieran O’Donnell, deputising for McGuinness, said that a transcript of the hearings would be sent to the Department of Taoiseach and the Department of Enterprise (now the Department of Jobs) to bring the matters raised to their attention. Email “'A farce': TDs at odds over claims government sought to undermine McGuinness”. Feedback on “'A farce': TDs at odds over claims government sought to undermine McGuinness”.